PDAC 2016 was attended by over 22,000 people from all over the mining world. At this year’s show the sentiment remained somewhat cautious but more upbeat then last year’s conference. A noticeable drop in the number of companies attended was a reflection of the expected clean-up of companies that were under capitalized, and or under managed. The weak have been culled and the strong remain. Despite the relatively positive performance in commodities, and upticks in many of the major mine companies, there was a noticeable absence of retail investors whom remain cautious. Many booths were hosted by the C-level management a clear sign of cost cutting (though C-level management should always make themselves available in good and bad times). Most major companies are well off their lows for the year. Perhaps short covering, or insider buying contributing the most. Concerns for over supply and weaker demand in China remain and supply demand balances have yet to settle the market price. This may be the key year for accumulating positions in strong balance sheets and management. Taking a long term approach to the mining sector. Deals are getting done and the market has cut back on production in most commodities. Further downward pressures on commodity prices may be coming but most equities have not been drafted up with the run in commodity prices and may not be impacted by a future decrease. Iron ore prices are down 48% year to date and BHP is looking towards copper to offset a dimming outlook for iron ore prices. Global miners such as Rio Tinto, and Vale have focused on iron ore for the majority of their profits. BHP always promoted their diversified portfolio but still recorded 52% of their operational profits from iron ore in 2014. We have all heard statements made by various experts – many self proclaimed – about when the world’s resources will run out. “Peak Oil” an event based on M. King Hubbert’s theory, is the point in time when the maximum rate of petroleum extraction is reached, after which the rate of production is expected to enter terminal decline. The same theory has been applied to many other commodities, and resources. 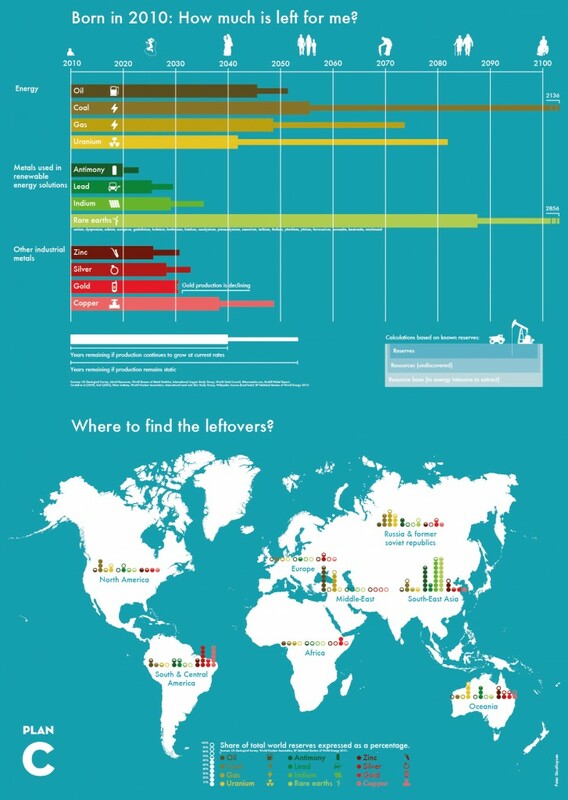 This infographic, by Visual Capitalist, shows you just how much is left. Key point with finite resources. Either prices have to go up, or major new discoveries have to be made. The latter requires investment in exploration. Unfortunately, there has been a drying up of capital for exploration over the last three years.